The gentleness of olive oil and its ability to act as a humectant and draw moisture from the air to your skin makes Castile soap wonderful to use. The bubbles of Castile Soap are low and plentiful. Castile Soap is gentle enough for a newborn baby's tender skin, can be used as a post-surgical soap or to hydrate older skin, which can become thinner and parchment-like, vulnerable to bruising. Olive Oil is the simplest oil to use in soap making and creates the gentlest of soaps. 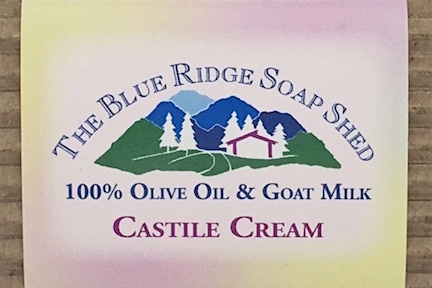 If you enjoy the gentleness of an olive oil soap but feel your skin needs more moisture, consider our Castile Cream olive oil soap which is still 100% olive oil as the base oil, but with goat milk added. Our Castile Soap is available in unscented, or gently scented at half strength with peppermint or lavender natural essential oils. Castile Soap was originally created in Castile, Spain, in the Mediterranean where Olive Oil has always been plentiful. It has sometimes been spelled Castille. A true Castile soap is always 100% Olive Oil, NOT 'mostly' Olive Oil. It is white in color and sometimes softer than other soaps because it contains none of the other oils which contribute hardness to a bar of soap. Lavender Castile Soap, this one's lightly scented with Lavender Essential Oil for sensitive skin. Double Mint Castile Soap is a 100% Olive Oil Castile soap, lightly scented with natural Spearmint and Peppermint Essential Oils for sensitive skin.